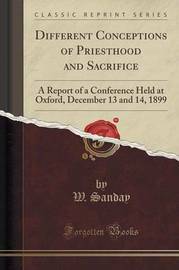 Excerpt from Different Conceptions of Priesthood and Sacrifice: A Report of a Conference Held at Oxford, December 13 and 14, 1899 The publication of this Report is felt to be an experiment. It was decided upon at an informal meeting after the conclusion of the Conference, not quite unanimously, but by a considerable preponderance of opinion; and the writer of this was entrusted with the duties of editor. The publication was indeed open to drawbacks which, in some respects, have proved rather greater than had been anticipated. The shorthand report, on which the reproduction of the discussions depended, was not a complete success. It was a somewhat condensed version of speeches which, by the necessities of the case, were themselves condensed within the narrowest limits possible; so that the inevitable appearance of scrappiness in consequence has been increased beyond what it perhaps might have been. I must, however, as editor, warmly acknowledge the help that has been given me by the several contributors, and by some in especial degree, in restoring the report of what they had said to a sufficiently full and readable form. The discussions were conspicuously marked, not only by the frankness which Archdeacon Wilson invited (p. 51) and of which he himself set an excellent example, but also by an effort after brevity and precision. And compressed as the result still is, I cannot but think that it will be found to map out the main lines of the important subject discussed, at once with a clearness and boldness of relief and - if I may say so - an accuracy of shading with which I doubt if it has ever been presented before. About the Publisher Forgotten Books publishes hundreds of thousands of rare and classic books. Find more at www.forgottenbooks.com This book is a reproduction of an important historical work. Forgotten Books uses state-of-the-art technology to digitally reconstruct the work, preserving the original format whilst repairing imperfections present in the aged copy. In rare cases, an imperfection in the original, such as a blemish or missing page, may be replicated in our edition. We do, however, repair the vast majority of imperfections successfully; any imperfections that remain are intentionally left to preserve the state of such historical works.